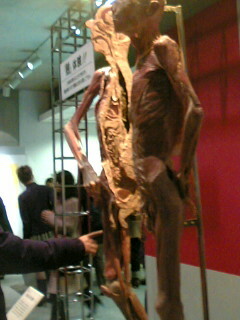 If you are into human bodies peeled and sliced at every possible angle, in every possible direction… then the exhibit at Tokyo Kokusai Forum is for you. Oh I wish i could see that! are there any more pictures anywhere? Well, taking pictures was strongly forbidden… And as you can see from the picture above, offenders are not treated very well… And these damn japanese phones all make a rather loud “snap” sound when taking a picture (on purpose, and per government requirement): I really had to sneak that one pic above.